It might not be fast, but the Micra has proven to be a tough little competitor. The cars are outfitted with roll cages and use the shock powertrains. Nissan Canada has revived the adage “race on Sunday, sell on Monday” with its unique Micra Cup racing series. The automaker doesn’t actually know whether more subcompact Micras are rolling off dealer lots as a result of the two-year-old program, but Nissan executives say it’s a solid marketing success. Micra Cup is a showcase for racing on the cheap. Nissan sells the race-prepped car, largely stock except for suspension upgrades and safety gear, for around $23,000, complete with driving suit. It costs roughly $30,000 to campaign the car for a season. The series’ prime goal is to raise Micra’s profile in its principal markets of Ontario and Quebec. “We don’t do the Micra Cup just for fun,” Nissan Canada Communications Director Didier Marsaud told Automotive News Canada. Unlike Porsche, whose clientele expects the company to be involved in motorsport, Nissan’s decision to launch a one-make series for its entry-level car is unusual. Honda’s “spec” series for the Civic and the Players/GM series’ Camaros were literally last-century. The idea came from a Quebec automotive journalist as Nissan was looking for ways to promote the 2015 return of the Micra nameplate to Canada after a 24-year absence, said Andrew Wilton, Micra’s chief marketing manager. The budget, like the car, was small. The series began with four events in Quebec and expanded to eight this season, including one in Ontario at Canadian Tire Motorsport Park (formerly Mosport). Most promotion has been regional, but Nissan had a national TV campaign on TSN sports channel in 2015 featuring Montreal IndyCar racer Alex Tagliani. “Not a massive media spend for that but still part of our overall marketing spend,” said Wilton. Quebec dealers also bought in, said Marsaud, sponsoring racers and displaying cars. 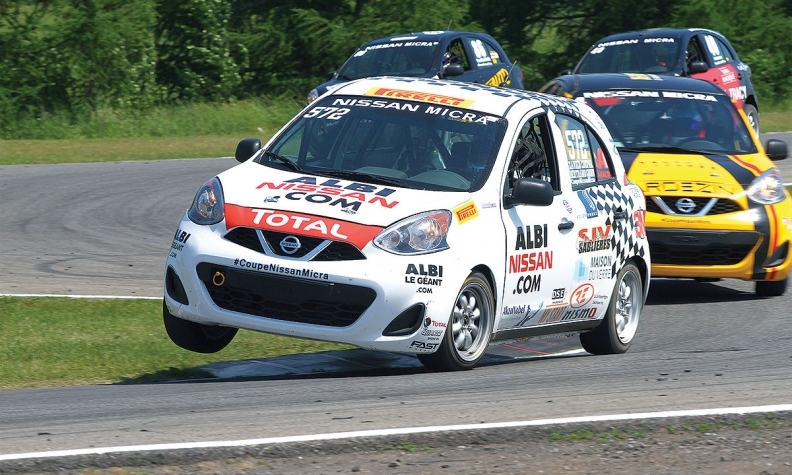 Touchette Group, a Quebec-based tire distributor, uses Micra Cup as a promotional tool, bringing customers to races. There’s no data on whether the Micra Cup actually moves metal, but it has raised awareness of Micra among its target demographic: young people who see it simply as inexpensive wheels. The race series demonstrates that it is affordable as well as reliable and fun, said Wilton. “The message that you can get all of those things in the most affordable car in Canada I think is a strong one and the racing just reinforces that. “It must be a good car if they can put it on the track and it’s fun to drive,” Wilton said. Mike Carcamo, Nismo head of global motorsport, calls the program “a benchmark on how a local country can activate and promote a product with motorsport,” Marsaud said.